This fine example of a lovely park home is situated in a peaceful semi-rural setting within Moor Farm Caravan Park on the edge of Calverton, a popular village surrounded by open countryside plus great links to Nottingham City Centre. Offering tastefully decorated and well presented accommodation throughout, briefly comprising: lounge with patio doors leading out onto a raised decked patio area, and double doors opening into a separate dining room; there is a modern fitted kitchen with a range of cream high gloss fronted doors, 'subway' tiled splashbacks and slate effect tiled flooring, plus an inner hallway providing access to two generously sized double bedrooms and a bathroom suite fitted in white, complimented by tiled walls. Outside the property benefits from level lawned gardens to three sides complete with decked patios, the majority being enclosed by fencing. To the front/side of the property is driveway parking. Residents also benefit from visitors parking towards the entrance of the development, plus well maintained communal grounds. Location - Moor Farm is an attractive development on the edge of Calverton, an ever popular village surrounded by stunning open countryside approximately 9 miles North of Nottingham City Centre. The property sits within walking distance of St Wilfrid's Square, a well supplied shopping precinct hosting a variety of shops and amenities. Accommodation - A uPVC double glazed sliding patio door leads into the lounge. Lounge - 5.92m x 2.69m (19'5" x 8'10") - With coving to the ceiling, a feature electric fireplace upon a marble hearth with marble back and wooden mantle surround, TV and telephone points, two electric storage heaters, two ceiling fan lights, two uPVC double glazed bow windows to the front aspect, and glazed double doors lead through into the dining room. Dining Room - 2.95m x 1.83m (9'8" x 6'0" ) - With fully tiled flooring, coving to the ceiling, a uPVC double glazed window to the side aspect, an electric storage heater, and doors to the inner hallway and kitchen. Kitchen - 2.87m x 2.62m (9'5" x 8'7") - With continuation of the tiled flooring, coving to the ceiling, and fitted with a range of high gloss cream fronted base and wall units with roll edge worksurfaces over and fully tiled splashbacks. There is a built-in storage cupboard housing the hot water cylinder, access hatch to the loft space, a built-in four ring electric hob with matching single oven beneath and pull out extractor fan over, space and connection for a full height fridge freezer, space and plumbing for a washing machine, inset sink and drainer with mixer tap over, and uPVC double glazed window and door to the side aspect. Inner Hallway - 1.68m x 0.89m (5'6" x 2'11") - Leading off the dining room giving access to two bedrooms and the bathroom suite, with coving to the ceiling. Bedroom One - 2.87m x 2.87m (9'5" x 9'5") - With coving to the ceiling, central ceiling light with fan, fitted wardrobe units with sliding doors, an electric storage heater, and uPVC double glazed window to the rear aspect. 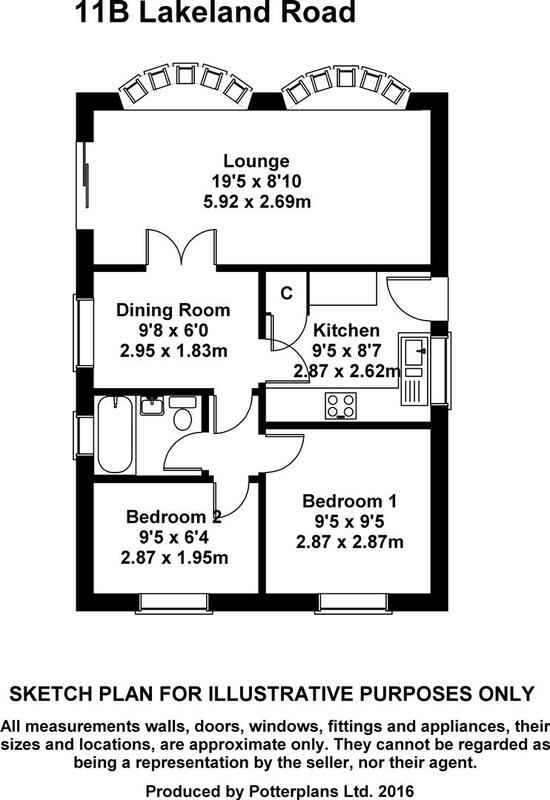 Bedroom Two - 2.87m x 1.93m (9'5" x 6'4") - With coving to the ceiling, fitted wardrobe units with sliding doors, central ceiling light with fan, uPVC double glazed window to the rear aspect, and an electric storage heater. Bathroom Suite - 1.96m x 1.65m (6'5" x 5'5") - With tile effect flooring, fully tiled walls, and fitted with a white three piece suite comprising: a panel sided bath with an electric Briston B85 shower over, and bi-fold glazed door; pedestal wash hand basin; low level closed coupled toilet. There is an extractor fan to the ceiling, and a uPVC double glazed obscured window to the side aspect. Driveway Parking - There is driveway parking to the side of the property. Gardens - There is a lawned area to the front of the plot with planted borders under the lounge windows, and picket style fencing with gated access either side leading into the side and rear gardens. To the right hand side steps lead up to a gated decked side terrace and access into the lounge, and to the left hand side there is a paved pathway leading to further steps up to the side entrance door into the kitchen. The side and rear gardens are majority laid to lawn with a wooden pergola, planted beds and borders, a circular paved patio area, and all enclosed by timber panelled fencing. Park Charges/Info - Pitch charge is currently £146.07 (2018) per 4 weeks - include the sewerage and water supply, the current owner arranges the electricity supply. Gas is currently not provided. A 10% clawback is payable to the park home by the seller upon completion.